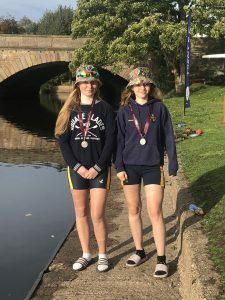 Thomasin and Tara proved they were the pick of the bunch not only by winning a well-deserved first place medal in the J15 Double Scull, but also by being faster than all the J16 Sculls as well. Furthermore, in a subtle escalation of the Henhan headwear fashion stakes they proved that the trendy 1960s look is definitely back in vogue by sporting their stylishly matching sunhats. Captain Keith is also sometimes seen (but never photographed) wearing a similar shape hat, although his own (original) version is unfortunately rather more ‘Bill and Ben’ than Sergeant Pepper. Perhaps the nostalgia was all too much for the old men as they fondly remembered the decade of Love, Peace, and Burton’s Wagon Wheels, since neither the Coxed or Coxless Fours were able to find that extra little bit of speed (as it used to be called). However, having scared off all other coxless entries, Keith, Charlie, Nick and Jerry had the honour of rowing as crew Number 1, for time only. With Woody still undergoing refit this was a chance for the crew to take Quasi for a spin. The unfamiliarity of the plastic boat took its toll as the Masters were unable to reproduce their usual momentum, especially with Nick steering from the 2 seat whilst the rudder was connected to Jerry’s foot at bow. Jerry subsequently made his point by putting no more than the thickness of a sheet of Izal between the strokeside blades and the railway bridge stone arch, afterwards claiming that that was where the fastest stream was. Pulling away from the chasing boats the men were the first to cross the finish line, to warm applause from the spectators and bringing back memories of the similarly placed ‘missing man’ Eight from Burton 2016. Meanwhile Laurence gained his first experience of Head Racing and learned a useful lesson i.e. you always seem to row better when someone is overtaking you. Whilst this is quite true it is perhaps not always a winning tactic. However, alongside Jonathan and Adam on this occasion it is great to see a fresh LBC crew appearing at races and hungry for victory – or at least for the post race cakes.